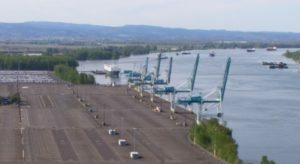 The Port of Portland has announced that Swire Shipping will start a container service calling at the Port’s Terminal 6 since January 2018. The announcement follows the recent trade mission visit of the Oregon State’s Governor Kate Brown and the Port representatives to Hong Kong, where they met with Swire corporate executives. Located on the Columbia river, Portland’s Terminal 6 is a niche facility, as due to the draft constraints it can accommodate only medium-sized vessels of up to 10,000 TEU. Still, the 420-acre mutli-purpose terminal serves a large market covering Oregon, Idaho and southwest Washington and acts as an important gateway for auto imports/exports (Ford, Hyundai and Honda have their own dedicated plots at the terminal), break bulk (steel slabs, coil, lumber) and containerized cargos, much of which are local agricultural and wood products exported overseas and imported consumer goods. The terminal features barge and direct rail services. However, in 2012 ICTSI, which was the operator of Terminal 6, got entangled in a legal dispute with the International Longshore and Warehouse Union, which seriously affected the terminal’s productivity. As a result, Hanjin Shipping, that at the time accounted for about 80% of T6’s container volume, announced in February 2015 that it would stop calling Portland. Soon Hapag-Lloyd and Westwood Shipping did the same, and since last May no vessels have been calling T6. This situation has caused ICTSI terminate its 25-year lease agreement with the Port of Portland on 31 March 2017. Since that time the port has been working hard to attract new carriers and resume shipping services for Oregon and Pacific Northwest shippers. Swire Shipping is “a first step, but a critical first step”, said Keith Leavitt, Portland’s Chief Commercial Officer. The Swire Shipping service will be a mix of general, container and non-containerized cargo. The ship call at Terminal 6 is likely to be monthly and includes export shipments of Western Star trucks to Australia, export containers to Australia / New Zealand, and import containers from Asia. The trucks are manufactured by Daimler Trucks North America at their Swan Island plant in Portland.